It is regarded as the perfect memory foam cervical neck support pillow. 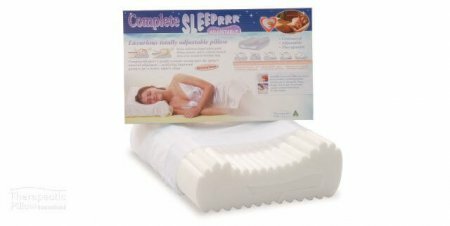 The Complete Sleeper Original Memory Foam pillow is a soft version of the Complete Sleeper range. It is sold and recommended throughout Australia by Chiropractors, Physiotherapists, Osteopaths, and many more health professionals. It is regarded as the perfect memory foam cervical neck support pillow. With its multiple adjustability options and unique ability to suit many different body shapes. Therapeutic Pillow the makers of the Complete Sleeper are proud to be Australian made & Australian owned. You can trust the quality, design, and reputation of our products. The Complete Sleeper features ‘higher’ and ‘lower’ sides as well as contour variance for maximum individual support and comfort for side or back sleeping. the pillow’s clever design encourages side sleeping which enhances breathing, which may also be helpful in minimising light snoring. Scalloped under-edges allow shoulder when side sleeping to slip snugly under pillow.